Airport: 45 km., Railway Station: 55 km. 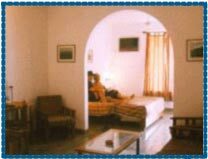 Hotel Sun Village is close to the major beaches and the shopping attractions of Goa. 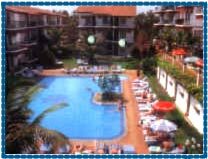 Sun Village Goa is located in the peaceful area of Goa the Aprora. Hotel overlooks the paddy fields and salt plans of Goa. The resort is located just at a distance of 1.2 kms from the famous Baga and Calangute beach & 2.5 kms from the Anjuna village which is renowned for its palm fringed Beaches and flea market. Sun Village presents an indulgent, all-suite hotel experience within its landscaped environment. The 135 rooms that are offered by the hotel are all air conditioned and consists of Standard and the Superior rooms. The rooms provide a unique blenmd of antique furniture and flashy colors that are embedded into room like an internal part of the room. Each room being offered by the hotel have been divided into two parts that consist of a sleeping area which has a bed, dressing table, large mirror and a spacious wardrobe and a living area that is equipped with a sofa, coffee table, luggage rack, drinks counter, fridge and television set. All rooms offer private balconies. Travel desk, Money Changer, Laundry facilities, Safe deposit Box, Conference facilities, Internet Access, Health Club & Gym, Ayurvedic Centre, Beauty Saloon, Shopping Arcade, Baby sitting services, Outdoor swimming pool, Separate Child pool, Kids entertainment centre, Indoor recreational facilities ( Billiards, Table Tennis), Air conditioned rooms, Hot/cold shower, Telephone without direct dial, Room Service, Tea / Coffee maker ( Only in Superior Rooms) Television, Mini bar, Writing table, Ceiling fan, Verandah / Balcony, Sitting area in the room.